Mishri opens her eyes and looks around. She touches her head and says Mapu. Ira runs up to her and kisses her all over her face. Are you fine? Mishri asks for Bapu. Akhilesh says I am here. She calls him Bapu. He rushes her to her side overwhelmed. She is my blood. He notices the locket around her neck and smiles through the tears. He kisses her hands lovingly. She is my daughter. Mishri nods. I wont let anything happen to you. I will go to Trinetri Baba. He shushes her. You don’t have to go anywhere. You will always stay with your Bapu. Mishri asks about her Mapu (Ira). Akhilesh holds Ira and tells Mishri that she will also stay with them. Ira cries. Mishri sits up excitedly. This was my dream! She thanks Bajrang Bali and dances happily on Pancchi Banu song. Ira and Akhilesh smile. Akhilesh wipes Ira’s tears. Mishri is shaking in her dreams. Nurse asks her if she is fine. Mishri realises that she had been dreaming. Nurse advises her to rest and goes to inform everyone that Mishri is up. Mishri prays that her dream turns out to be true. Nurse informs Ira that Mishri has gained conscious. Akhilesh hears it too. Ira runs to tell it to him but he stands there like a stone. She thanks him for saving Mishri’s life by giving her his blood. She will be really happy to see you. Please come. He stays put. She requests him to meet Mishri. Don’t say that you don’t want to meet her? She is our daughter. He takes her aside to talk about something important before they meet Mishri. He asks Ira to sign on a blank paper. I have saved your daughter’s life. I am only asking for a sign in return. Ira asks him what will be written on it. Akhilesh narrates it. I, Ira Desai, am handing over my daughter Mishri’s custody to Akhilesh. She will live with her father after now and I have no right on her! Ira’s eyes widen in shock. Akhilesh tells Ira it isn’t a big price in return of saving Mishri’s life. Ira asks him if he knows what he is asking for. You dint do a favour on you by saving her. She is your and my daughter. I have given birth to her and raised her. I have taught her to walk and speak. I haven’t let her go away from me for even a second and wont let it happen ever! Nothing can separate me from my daughter! Akhilesh asks her what about him as she kept him away from his daughter all these years. You are the worst mother of the world. Mishri wanted to be with me but you dint let her come to me. You forced her to become Monu and be with me. Is this how you will raise her? Ira tells her to understand that she did all this just to save Mishri from Trinetri Baba. Akhilesh calls it a lie. It is in your nature to lie to everyone. You lied to me and everyone about my reversal too. She reasons she hid it for Moti Ba’s sake. He replies that she could have told him atleast. Truth is the basis of any relation and you broke ours by hiding it from me too! How are you right in keeping my daughter away from me? I would have done anything but had not let my daughter go to Baba. You knew I was yearning for a kid. I will never forgive you for keeping my daughter away from me. I wasn’t there when she would have taken her first steps or had said Bapu. You snatched this happiness from me. Can you return all this to me? Ira breaks down. Akhilesh tells her he wont let her harm his daughter anymore. Sign these papers and give me my daughter. I am giving you a day’s time. Sign them. If you cannot sign then think of the pain you have given to that girl and me. Saying so, he walks out of the room. Ira cries. How did I make such a big mistake? Pushpa and Vansh dance happily around Devina who tells them to control themselves. Pushpa says I cannot do it. You used to taunt me that you have a grandson. I also have a granddaughter now. Devina makes a face. Pushpa asks the servants to decorate the house and make sweets. She does another happy dance around Devina. Nurse has gotten Mishri ready. You are good to go home. Doc will do one last check up before you go home. Akhilesh enters wearing a doctor’s coat. He checks her eyes. Seems like you are tired looking for your Bapu since years. I will prescribe a medicine because of which you will be happy. He tickles her and makes her smile. He gives her chocolate in the name of injection. She happily takes it. Akhilesh tells her he wont let her go away from her ever. I will show you how happy I am. He dances sweetly around her. Mishri dances with him. She feels dizzy as she shakes her head. He immediately holds her. Don’t dance. She says I love you to him. He says I love you too to her. Let’s go home. She makes him pick her chocolate. They step out of the room when she asks for Mapu. Ira is hiding in a room. Akhilesh notices her but lies to Mishri that Ira is a little busy. I will take you home. Mishri nods. They head home. Bhavik asks Ira why she dint go with them. Ira shares that Akhilesh is angry with her for keeping Mishri away from him for all these years. He wants me to give Mishri’s condition to him and go away from their life for forever. Bhavik asks her how she can go away from Mishri’s life. She cannot live without you even for a day! Ira cries. It would have been better if he had asked me for my life instead of Mishri! What should I do now? She gives him her phone. It has every video of every first moment that Mishri has experienced till date. Please give it to Akhilesh. He will never forgive me but these memories might lessen my sins a little. He agrees but points out that she cannot go away from Mishri. Ira calls herself Akhilesh and Mishri’s culprit. Go now and keep me updated. Bhavik leaves reluctantly. Devina and her son come in their room and notice the servants packing her bags. Pushpa tells her this room is Mishri’s now. Vansh and Mishri cannot stay in the same room. They will grow up in a few years. You can stay in a small room. Devina argues but Pushpa advises her to go back to Banaras if it is a problem. Servants follow Pushpa’s commands. Devina wonders what all she will have to let go because of that Mishri. I wont let it happen! She tells her son that he has an equal right on the house as much as Akhilesh. Only Kunika can help us now. Where is she? Her son shrugs. Ira is crying looking at her photo with Mishri when Kunika calls out to her. Ira tell sher she isn’t trying to come between her and Akhilesh. Kunika hugs her surprising her. I am really very sorry. I have hated you very much till date but I have come to realise that Akhilesh already has a picture perfect family. He has you and Mishri. I am the one who he doesn’t want in his life. I wont be able to love Mishri like a mother. Only you can give her that love. It is true that I love Akhilesh very much but I am not selfish to come between you two. Ira denies. He needs you. Kunika speaks of Mishri. Ira knows Akhilesh does not even want to see her face. Kunika tells Ira she will speak to Akhilesh. He will have to accept you. I have kept a welcome part for Mishri in the evening. I want you to be there. I will talk to Akhilesh in the party. Ira tells her Akhilesh wont like it but Kunika requests her to come for Mishri’s sake if not for her. Precap: Akhilesh asks Mishri to choose either him or Ira. Your Mapu and I cannot live under the same roof. Mishri and Ira are stunned. 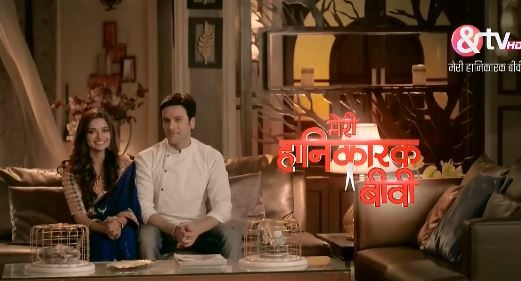 The post Meri Hanikarak Biwi 12th March 2019 Written Episode Update: Akhilesh takes Mishri home appeared first on Telly Updates.